A Good Day to Die Hard is a chaotic portrait of one man’s wearying struggle to keep his head held high while braving a seemingly unconquerable bad situation. Unfortunately, this time around, it isn’t really perpetually unlucky NYDP cop John McClane being run mercilessly through the ringer before our eyes. 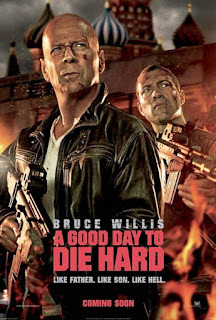 No, its series star Bruce Willis, who trudges through his fifth tour of Die Hard duty wearing the tired, reluctant frown of an actor well aware that he’s a long, sad way from Nakatomi Tower. Wandering through a gauntlet of slapped-together noisy nonsense constructed by the hacky 20th Century Fox lackey duo of helmer John Moore (Max Payne, Behind Enemy Lines) and screenwriter Skip Woods (X-Men Origins: Wolverine, The A-Team), Willis smirks dutifully, however the surly spark is gone. The once ornery John McClane has been replaced by a largely emotionless killing machine that unflinchingly mows down villains by the dozen and walks away from near-death experiences with nary a scratch. 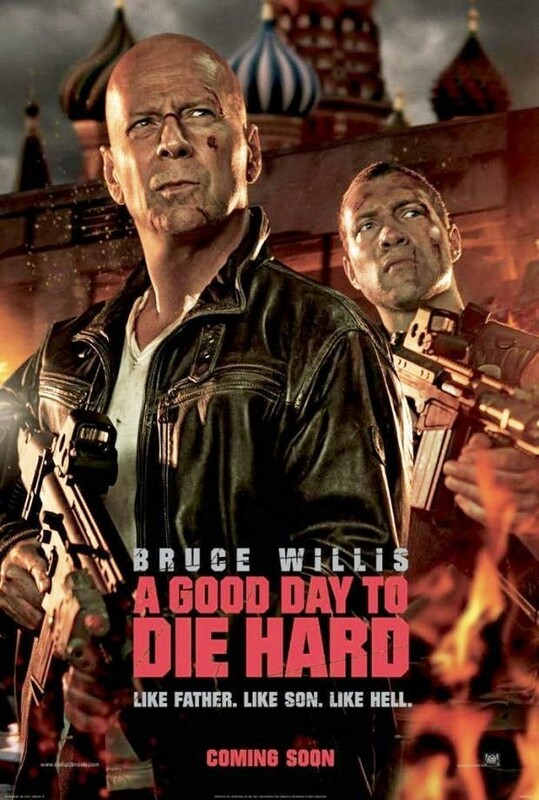 As an entry in a franchise built around the concept of a flawed, all-too-human hero dragging himself through hell while bitching all the way, A Good Day to Die Hard misses more notes than a tone-deaf kazoo novice. 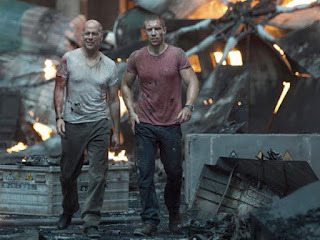 Going international for the first time, McClane’s latest body count-clocking escapade sends him to Russia in order to attend the trial of his estranged son Jack (Jai Courtney), an undercover CIA agent secretly assigned to protect a political prisoner (Sebastian Koch) from his deadly former colleagues. Fate intervenes, though, when the courtroom is demolished by armed mercenaries and the two quarreling relations are thrown together on a desperate chase to recover a top secret file containing, uh, top secret stuff! About nuclear weapons and so forth! Of course, this being a Die Hard picture, there are plenty of hazards on the road to massive property (and collateral) damage-causing victory and familial fence-mending, including an evil hot babe (Yuliya Snigir – whose heavily advertised motorcycle gear stripping scene is absent from the finished film. Just sayin’!) and a tattooed soft shoe routine-performing thug (Radivoje Bukvic). While all these elements sound workable on paper, A Good Day to Die Hard is depressingly lazy and uninterested in delivering the classic elements that have kept the series vital. McClane feels neutered, transformed into a one-note destructive tagalong without any good wiseass quips or apprehension, and he’s stuck with a wooden ally devoid of dimension. Courtney is a capable physical presence – as evidenced in Jack Reacher – yet his underwritten character only serves to underscore the fact that, as a sidekick, he seriously lacks the charisma of Samuel L. Jackson or Justin Long. Worse, the bad guys this go-around are flat-out disposable bores. Die Hard has a rich history of eccentric villainous personalities, and these anonymous jokers feel like placeholders for more memorable, layered antagonists. They aren’t threatening or compelling – their master plan is labyrinthine in its ludicrous convolution – and the waves of masked pop-up henchmen resemble easy obstacles in a video game. As an example of unrelenting action spectacle, the picture strains vainly to reach the low bar marked “competent.” Moore doesn’t have any personality behind the camera, and his large-scale set-pieces – executed by an admirably committed team of stuntmen and technicians – suffer for it. The rushing impact of an early extended sequence of multi-vehicle annihilation is weakened by sloppy editing that makes a mockery of geography and dulls the coolest bits. The same can be said for the climactic assault, which features abundant gunfire and deadly helicopter hijinx but – minus an ambitious final pyro-happy money shot – not a whole lotta excitement. Say what you will about the series’ previous sequels, there were at least conscious attempts made to push McClane into clever new places and create explosive scenarios that topped what came before. This lame entry doesn’t even try for innovation; it’s a generic, forgettable product churned out by filmmakers ill-fitted for handling the responsibility of the beloved property they’ve taken ownership of. For the Die Hard brand, this is anything but a good day.